• All the Java source code presented in this book. • The student version of the net.datastructures package. • Slide handouts (four-per-page) in PDF format. • A database of hints to all exercises, indexed by problem number. • Java animations and interactive applets for data structures and algorithms. • Hyperlinks to other data structures and algorithms resources. We feel that the Java animations and interactive applets should be of particular interest, since they allow readers to interactively "play" with different data structures, which leads to better understanding of the different ADTs. In addition, the hints should be of considerable use to anyone needing a little help getting started on certain exercises. A classic combinatorial problem is to place n queens on an n × n chess board so that no queen threatens any other queen, that is, so that no two queens are on the same row, column, or diagonal. 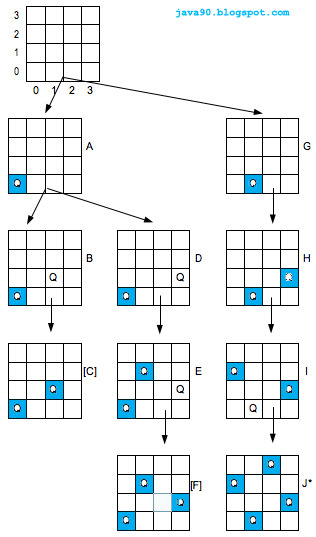 In order to reduce this solution space, it can now be assumed without loss of generality, that the ith queen is placed in the ith row, thereby avoiding those two queens can be in the same row. The following numbering system is followed in order to assign this number: Digits 1 and 2: The year of birthDigits 3-5: The number of the day in the year on which the person's birth date falls.A male would be assigned the number 1-366 and a female the number 501-866. This is a way of confirming if the person's listed birth date is accurate. A male's birth date would be represented by the exact number of days, a female's birth date would be represented by the exact number of days + 500. Example: The first five digits of the NIC for a male born on 1 January 1997 would be 97001; however, a female born on that same date would be 97501.